Hackney Hopster by London Fields Brewery (LFB) was the beer that introduced me to a resurgent London brewing scene. I spent the summer of 2012 drinking this “Pacific Pale Ale” in and around Hackney, on one occasion to the apparent displeasure of an old curmudgeon at Ryan’s Bar in Stoke Newington. Born and bred in the borough, he scoffed at the idea of a beer brewed in Hackney sold at a “rip off” price. As the snarling, gnarled old malcontent sneered over his glass of generic lager, however, I reckoned I had the better deal. Anyway, *takes a deep breath* it can be reasonably argued Hopster isn’t the beer it once was, (whether due to staff turnover and associated variables or a deeper malaise), but it’s still a fine beer in my book, and I regard LFB’s Shoreditch Triangle as a very, very good IPA. But for my #12BeersofXmas day 11 beer I’ve decided to go with something more befitting of the season – the Black Path Porter. It has the the distinct coffee aroma and flavour from the roasted malts you’d expect but this beer is all about the chocolate – when I first tried it as a sample at Oddbins in Crouch End I wished I had a chocolate sponge cake with coffee icing served with cream to complement it. It’s not the best porter I’ve had but it’s more than decent and one of these days I’ll do that chocolate cake pairing. It’s been a troubled year for LFB but as 2015 beckons I wish the best for the brewers and the whole team. Slàinte. 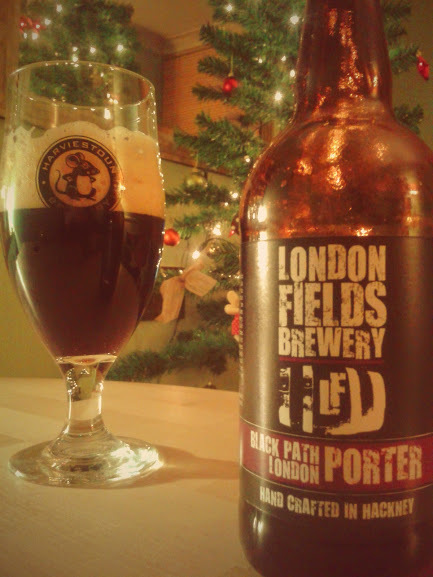 This entry was posted in Beers and tagged #12BeersofXmas, Black Path Porter, Craft Beer, London beer, London Fields Brewery. Bookmark the permalink.